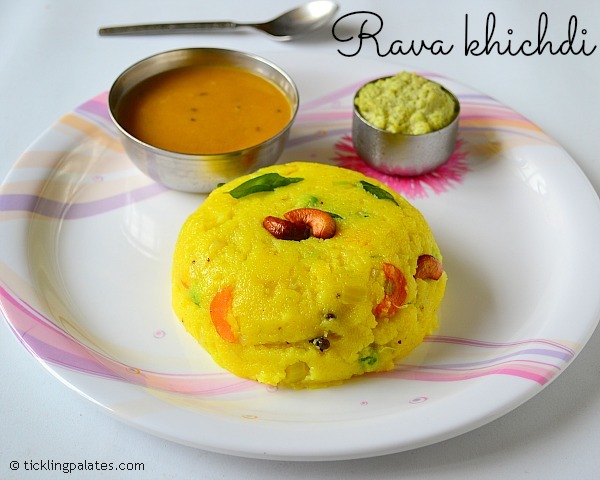 Rava Khichdi recipe happens to be one of my favourite breakfast or an evening tiffin to be enjoyed with dollops of ghee. My Grandmother got this recipe from a brahmin man who ran a quaint little hotel in the 60’s and its been the most loved recipe in our family ever since that. This recipe also happens to be our family’s lucky recipe as it is always served to all the grooms who comes to see the bride for the first time and every time the alliance has always ended up being finalised into marriages at the first shot itself. As I have grown up used to this recipe, I dislike it when people pass off a humble rava upma with vegetables as rava khichdi. 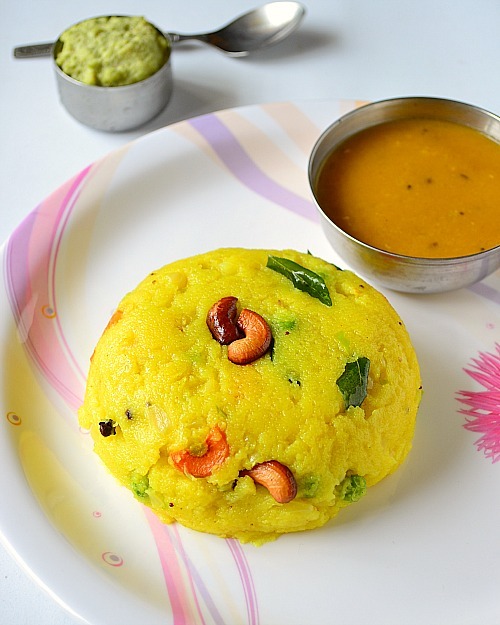 The difference between a rava khichdi and the upma is of course the addition of vegetables plus the the khichdi does not have dals added to the tempering unlike the upma and also it has other whole spices unlike the upma. 1. If you are using double roasted suji, you can skip the roasting part. 2. You can add tomatoes as well but as it will make the khichdi more mushy, I never add it. But if you wish to add, just quarter them and add. Do not chop finely. 3. If you are calorie conscious, avoid ghee and make it with oil. But the aroma and flavor will not be the same. 4. Adjust the green chilies according to your spice level. 5. If you do not wish to bite into the whole spices, grind the spices excepting the bay leaf with the green chili and ginger. 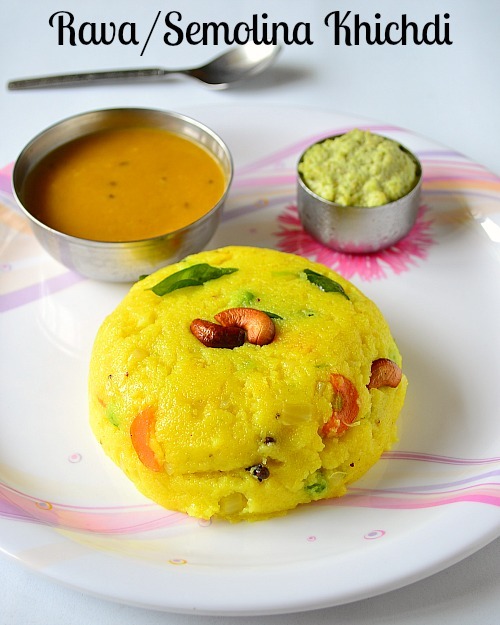 You can check other breakfast recipes using Rava like Onion Rava Dosa, Oats Idli, Rava khara pongal and savory semolina cake. 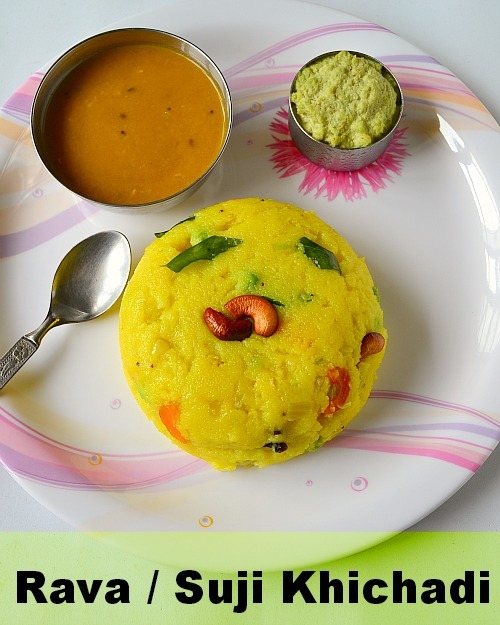 Rava Khichdi served with coconut chutney and sambar for breakfast. Chop the onions finely. Thinly slice the potatoes and carrots. Microwave carrots, potatoes, green peas at high for 2 minutes. You can also blanch them on stove top. Keep aside. Grind both green chili and ginger without adding any water and keep aside. Heat ghee in a pan, add the cashews and roast till golden brown, drain and keep aside. Add oil and vanaspati to the same pan. Add cloves, cardamom, cinnamon and bay leaf and sauté till you get the aroma. Add onions, curry leaves and sauté till the onions turn pink. Add the ground ginger and chili paste, mix well and cook for a minute. Add rava, turmeric powder, salt and keep sautéing over low flame for 2-3 minutes. The rava should get roasted well. Raise the flame to full. Add the blanched vegetables and pour the water with one hand into the rava mixture while mixing with a spatula with the other hand. Mix well. You can see the khichdi thickening while the water starts to bubble around. Simmer the flame completely. Close with a lid a let it cook for 4-5 minutes. Switch off stove and keep the khichdi closed with a lid so that the khichdi gets further cooked in the heat and it will become grainy and separate instead of being mushy. Add roasted cashew nuts to rava khichdi and mix well. Serve hot topped with more ghee along with coconut chutney and sambar. Thank you.I too hail from cbe and have the same problem.Being a full time working woman I often resort to dosas as I keep the batter stocked always. Just as you said if someone could think out the menu and organise the ingredients it would be easier for me to give my family and myself some variety.Now I can refer to you in times of crisis. Thanks. Thank you Jayanthi Nair. Keep Visiting. Hi Radhika, the sambar in this picture looks nice it reminds of the sambar i use to eat in a nair shop.